The See Phueng Khiaw Green Prai Oil Potion of Luang Por Tarb, of Wat Mai Grabok Kheun Pheung, was, and still is one of the most highly preferred See Pheung Potions with serious aficionados of the 'Krueang Rang' talismanic amulets Genre. Please note; The potions are sealed lids with affixative, as released from the temple, and are intended for Bucha, but most of them were broken open at some point or other by devotees who wished to smear the potion, which has resulted in most exhibits having cracked lids. 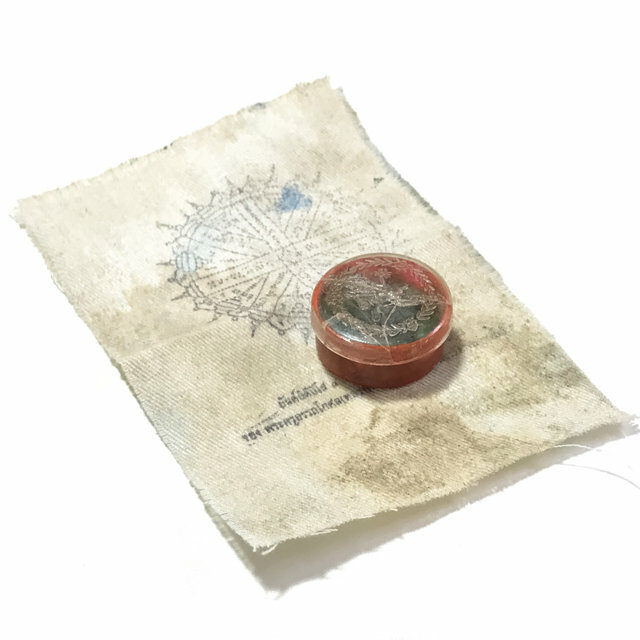 Although it is still sometimes possible to find the odd example of the Legendary see Pheung Khiaw of Luang Por Tarb, it is becoming ever rarer these days to see one in circulation in the Public Amulet Exchanges. Luang Por Tarb released the See Pheung in sealed pots with lids, and the Temple Comittee and Devotees encased some in waterproof spherical bubbles, and some was also used to fill small pots, for use as a smearing balm. it is possible to find See Pheung Luang Por Tarb in both forms of sealed, or consumable encasement.